PHOTO: Haiti on Fire - Haiti Pran DIFE! KREYOL: Mezanmi... Mwen fè yon MOVE Rèv pou Haiti... Mwen reve Vòlkan Eklate Tout kote! Sou tout tèt mòn yo... Dife Toupatou nan peyi a... Mwen reve Dife vòlkan yo nan tout rivyè nan peyi a? Moun ap chèche moun, moun paka wè moun... Mwen pa janm pataje rèv mwen yo avèk nou men rèv saa fèm pè... Kisa ou panse de sa??? Jah love. 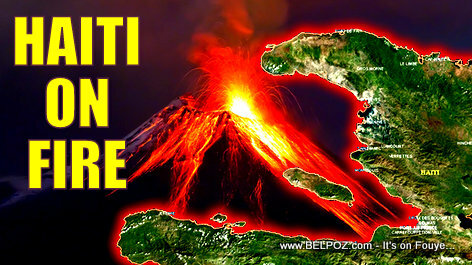 I don't think that there are any volcanoes in Ayiti. I believe that your dreams are about good things that are going to happen in the near future for Ayiti and her people. For me, volcanoes are a positive force and their eruption represents a passionate desire being unleashed. Mwen m ta eksplike sa nan latrinn nan anvan m vinn di sa nan Fessbouk. Konsa nou taka gen Nèij tou.